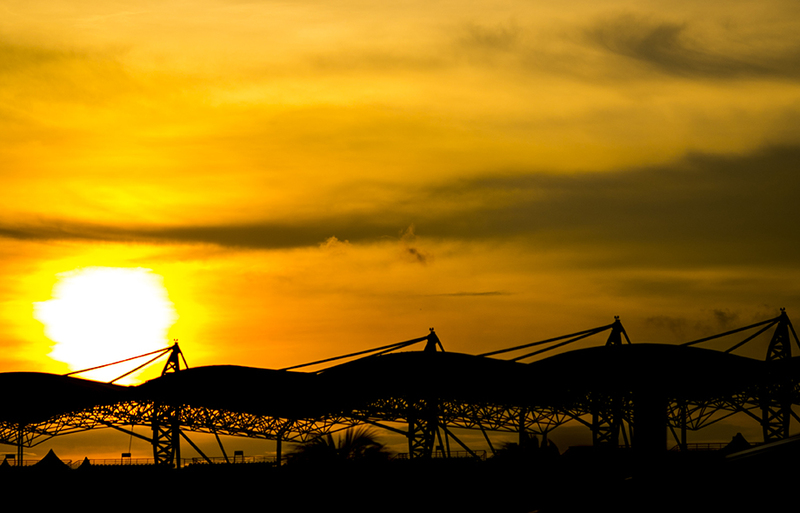 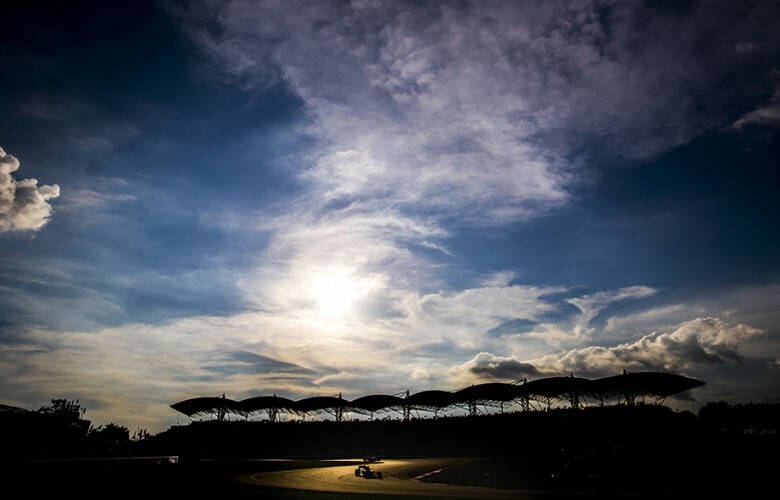 Sun goes down over the circuit during previews for the Malaysian Formula One Grand Prix at Sepang Circuit on September 28, 2017 in Sepang, Malaysia. 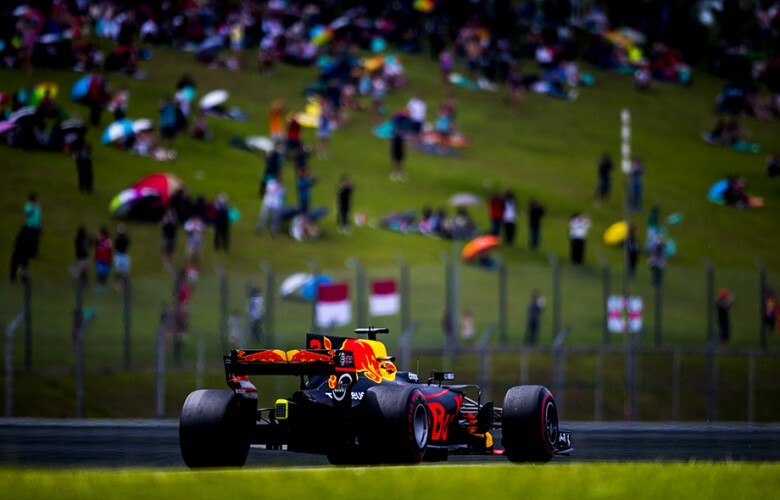 Max Verstappen of Netherlands and Red Bull Racing is pictured during previews for the Malaysian Formula One Grand Prix at Sepang Circuit on September 28, 2017 in Sepang, Malaysia. 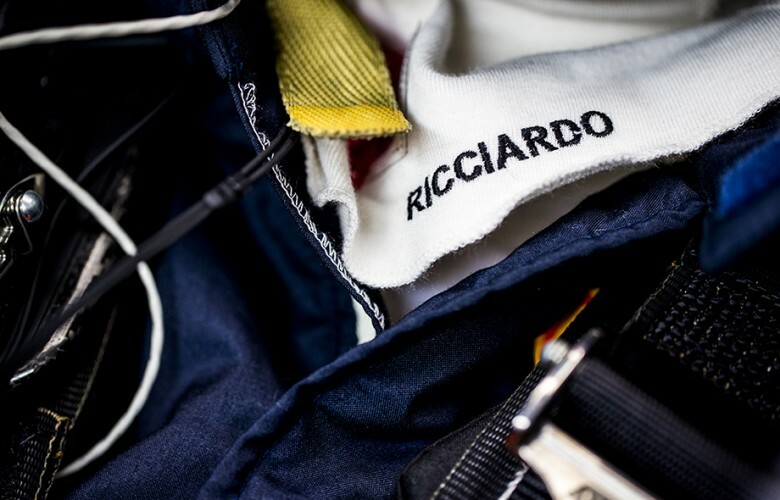 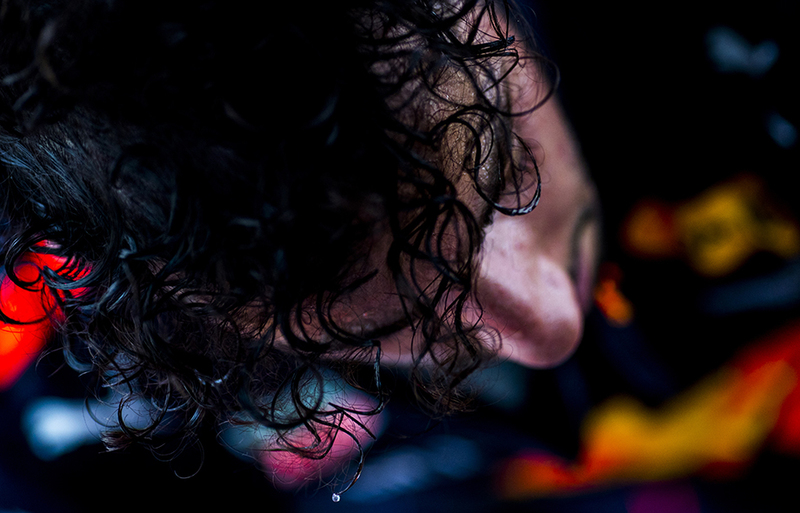 Daniel Ricciardo of Australia and Red Bull Racing sits inside his RB13 during practice for the Malaysian Formula One Grand Prix at Sepang Circuit on September 29, 2017 in Sepang, Malaysia. 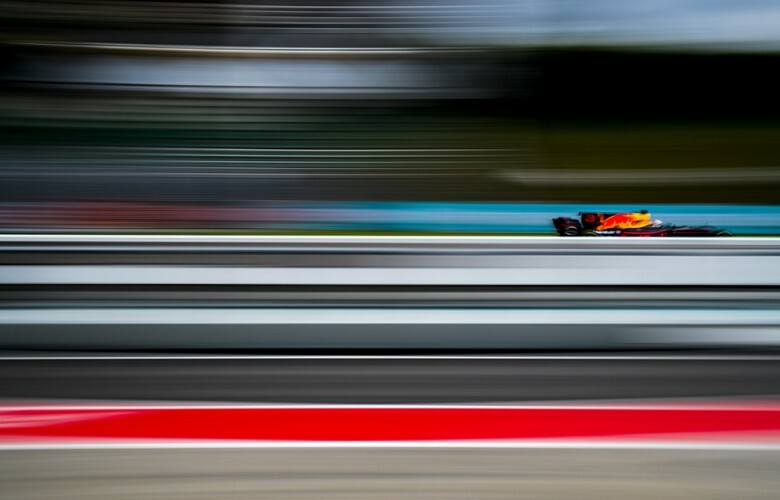 A detail view of the RB13 is seen during practice for the Malaysian Formula One Grand Prix at Sepang Circuit on September 29, 2017 in Sepang, Malaysia. 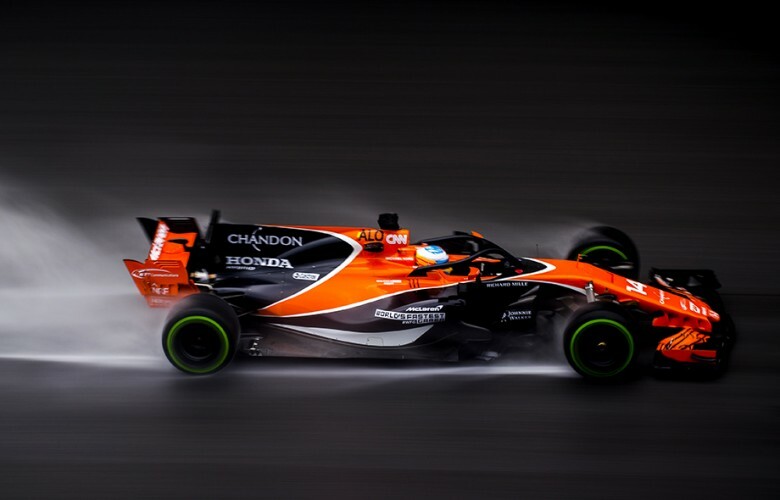 Stoffel Vandoorne of Belgium and McLaren-Honda drives his MCL32 during practice for the Malaysian Formula One Grand Prix at Sepang Circuit on September 29, 2017 in Sepang, Malaysia. Carlos Sainz of Spain and Scuderia Toro Rosso drives his STR12 during practice for the Malaysian Formula One Grand Prix at Sepang Circuit on September 29, 2017 in Sepang, Malaysia. 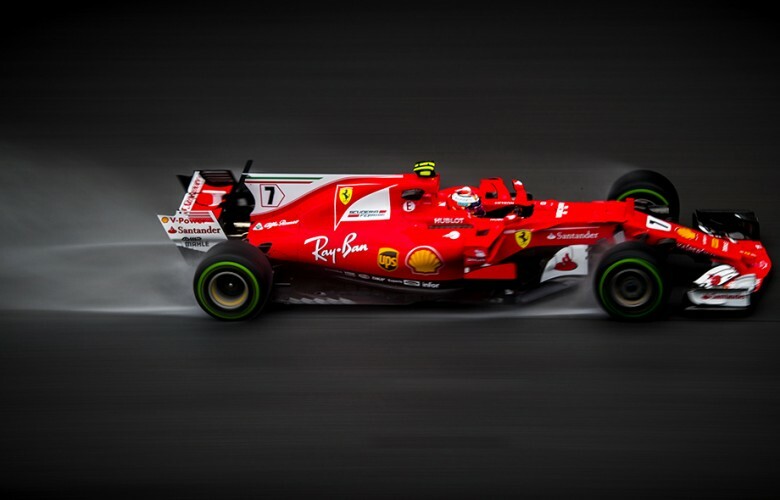 Kimi Raikkonen of Finland and Scuderia Ferrari drives his SF70H during practice for the Malaysian Formula One Grand Prix at Sepang Circuit on September 29, 2017 in Sepang, Malaysia. Max Verstappen of Netherlands and Red Bull Racing comes in for a pitstop during practice prior qualifying for the Malaysian Formula One Grand Prix at Sepang Circuit on September 30, 2017 in Sepang, Malaysia. Max Verstappen of Netherlands and Red Bull Racing speaks to his father Jos following the practice prior qualifying for the Malaysian Formula One Grand Prix at Sepang Circuit on September 30, 2017 in Sepang, Malaysia. 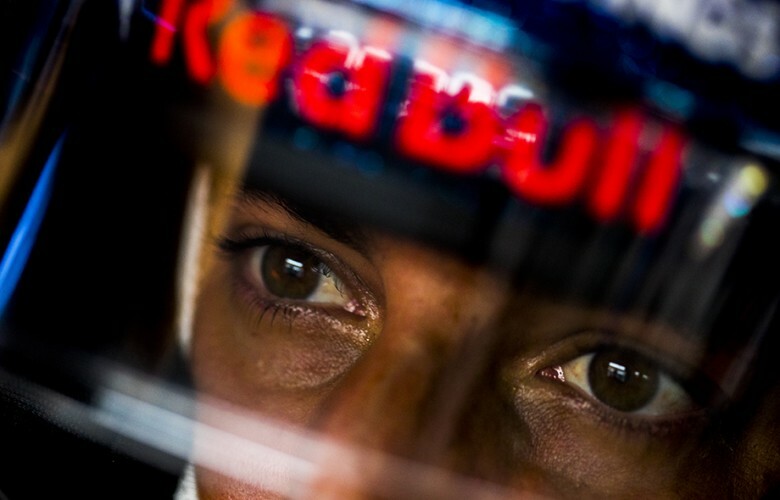 Daniel Ricciardo of Australia and Red Bull Racing looks on during practice for the Malaysian Formula One Grand Prix at Sepang Circuit on September 29, 2017 in Sepang, Malaysia. 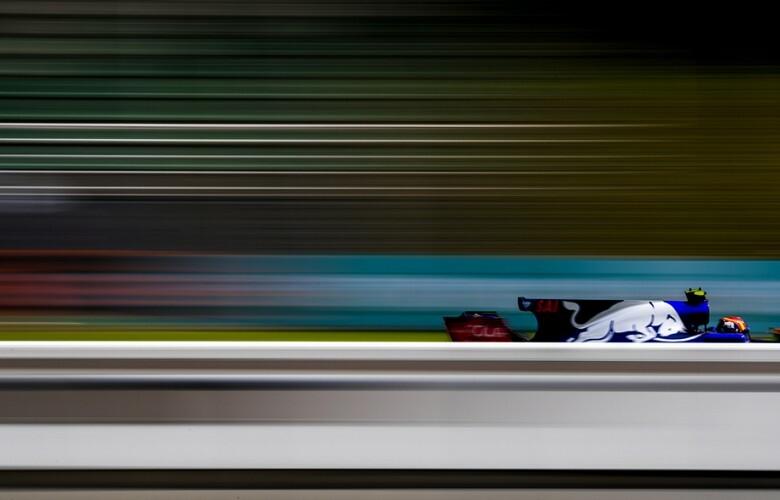 Pascal Wehrlein of Germany and Sauber F1 Team is seen in the paddock during practice for the Malaysian Formula One Grand Prix at Sepang Circuit on September 29, 2017 in Sepang, Malaysia. 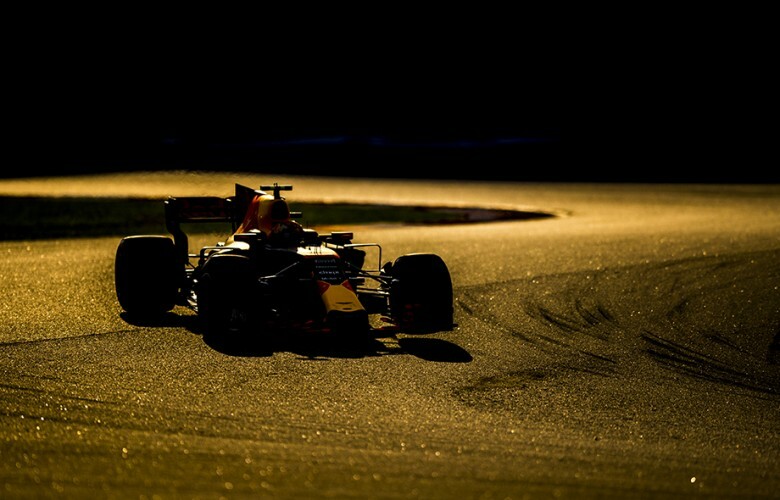 Max Verstappen of Netherlands and Red Bull Racing is pictured during practice for the Malaysian Formula One Grand Prix at Sepang Circuit on September 29, 2017 in Sepang, Malaysia. 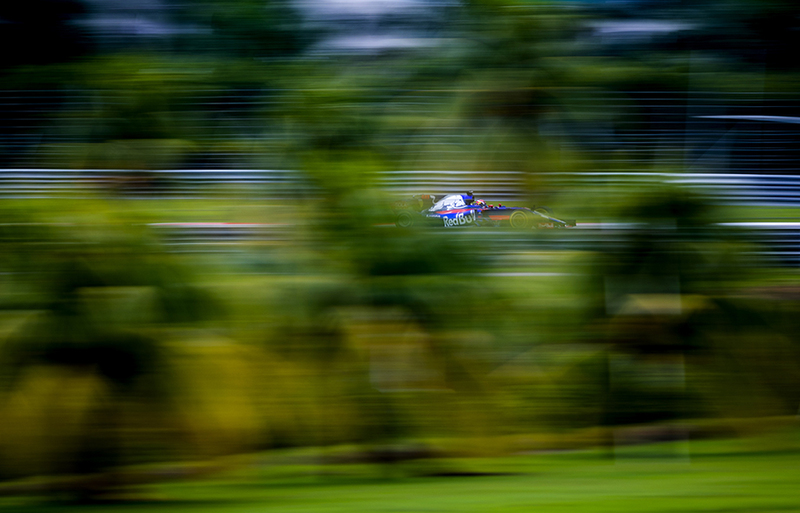 Sean Gelael of Indonesia and Toro Rosso in action during practice for the Malaysian Formula One Grand Prix at Sepang Circuit on September 29, 2017 in Sepang, Malaysia. 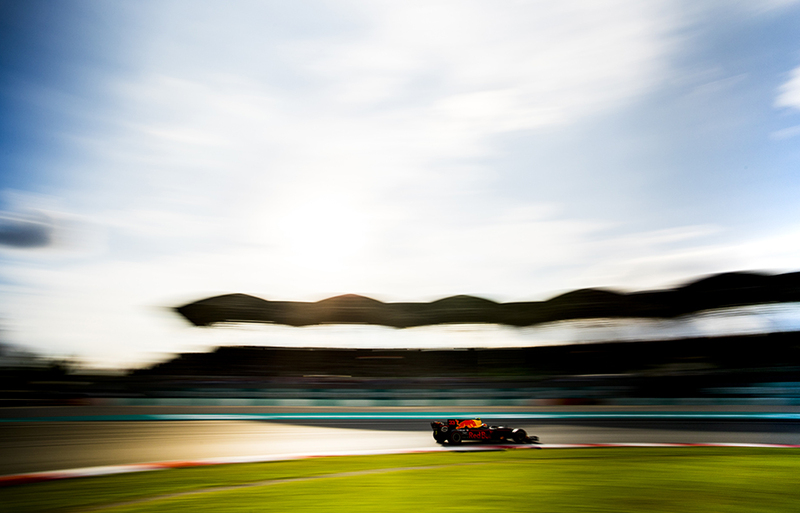 Daniel Ricciardo of Australia and Red Bull Racing drives his RB13 during practice for the Malaysian Formula One Grand Prix at Sepang Circuit on September 29, 2017 in Sepang, Malaysia. 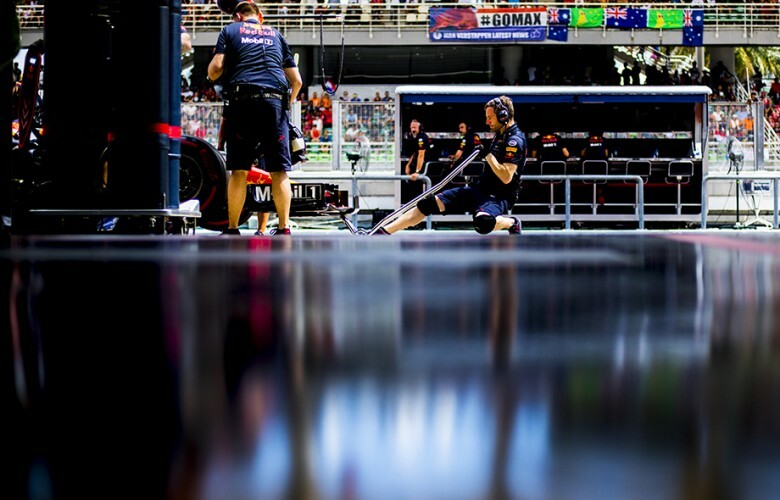 Max Verstappen of Netherlands and Red Bull Racing steps out of his RB13 during practice prior qualifying for the Malaysian Formula One Grand Prix at Sepang Circuit on September 30, 2017 in Sepang, Malaysia. Max Verstappen of Netherlands and Red Bull Racing drives his RB13 during qualifying for the Malaysian Formula One Grand Prix at Sepang Circuit on September 30, 2017 in Sepang, Malaysia. 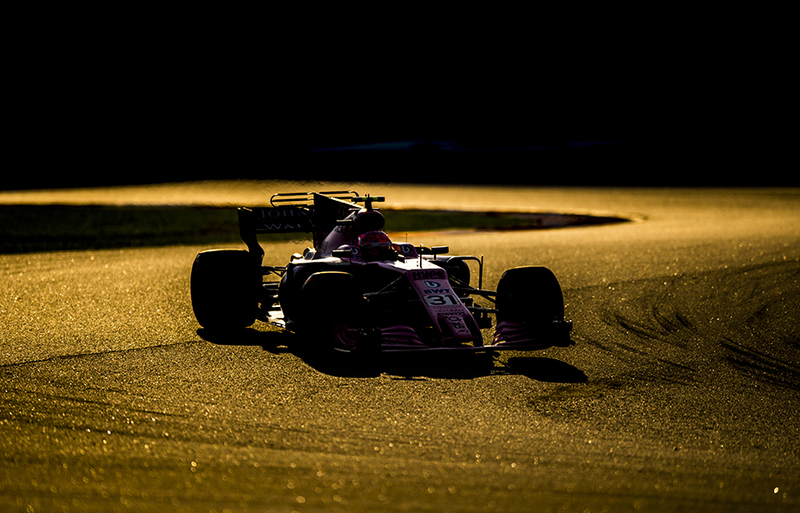 Esteban Ocon of France and Sahara Force India drives his VJM10 during qualifying for the Malaysian Formula One Grand Prix at Sepang Circuit on September 30, 2017 in Sepang, Malaysia. 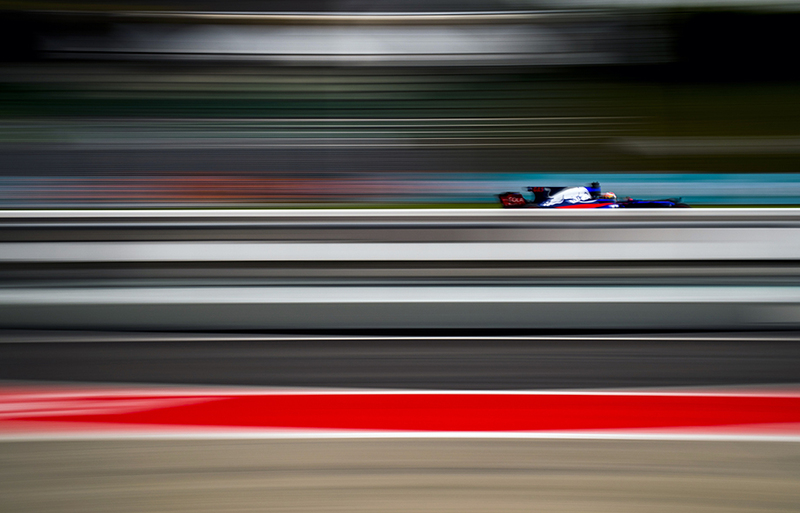 Pierre Gasly of France and Scuderia Toro Rosso drives his STR12 during practice for the Malaysian Formula One Grand Prix at Sepang Circuit on September 29, 2017 in Sepang, Malaysia. 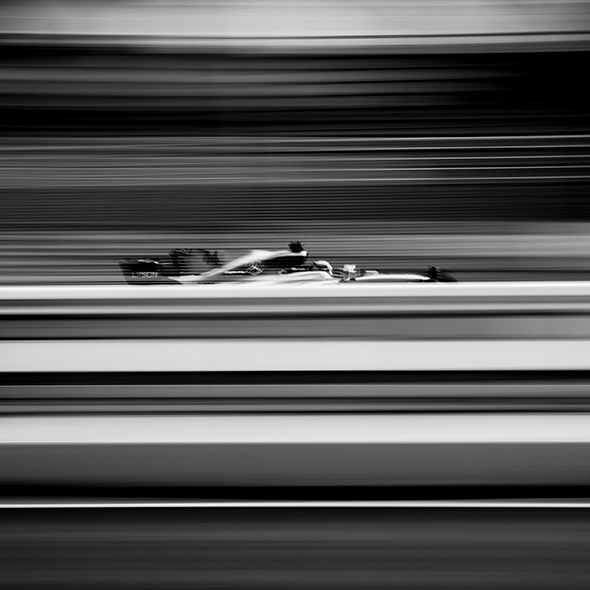 Jolyon Palmer of Great Britain and Renault drives his R.S.17 during qualifying for the Malaysian Formula One Grand Prix at Sepang Circuit on September 30, 2017 in Sepang, Malaysia. Fernando Alonso of Spain and McLaren-Honda drives his MCL32 during qualifying for the Malaysian Formula One Grand Prix at Sepang Circuit on September 30, 2017 in Sepang, Malaysia. 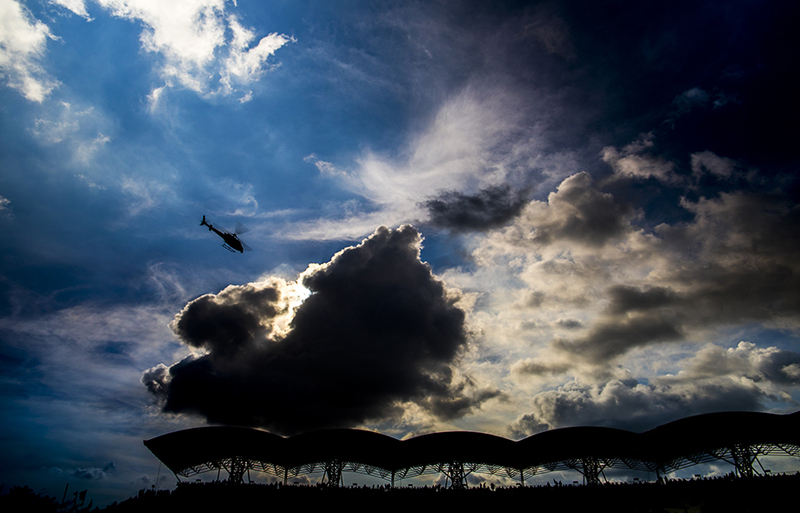 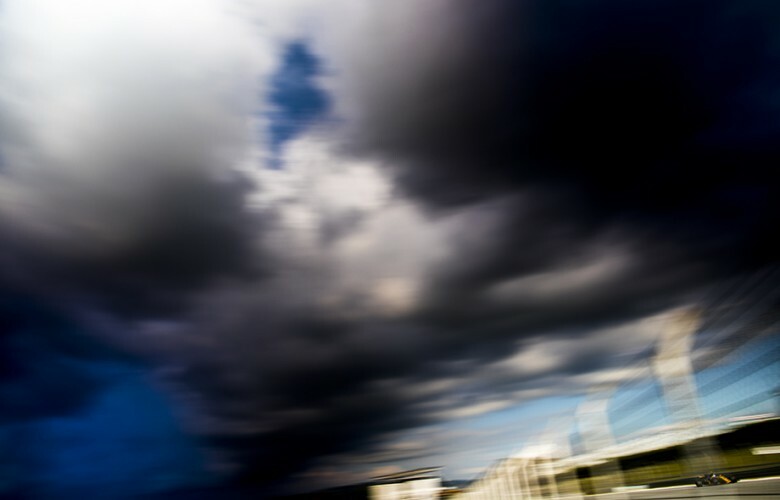 A broadcast helicopter flies over the first corner during qualifying for the Malaysian Formula One Grand Prix at Sepang Circuit on September 30, 2017 in Sepang, Malaysia. 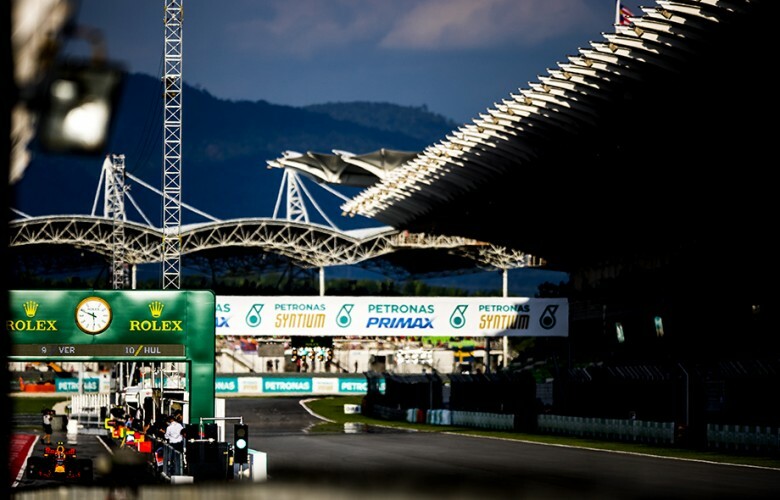 Lewis Hamilton of Great Britain and Mercedes AMG Petronas drives in W08 during practice for the Malaysian Formula One Grand Prix at Sepang Circuit on September 29, 2017 in Sepang, Malaysia. 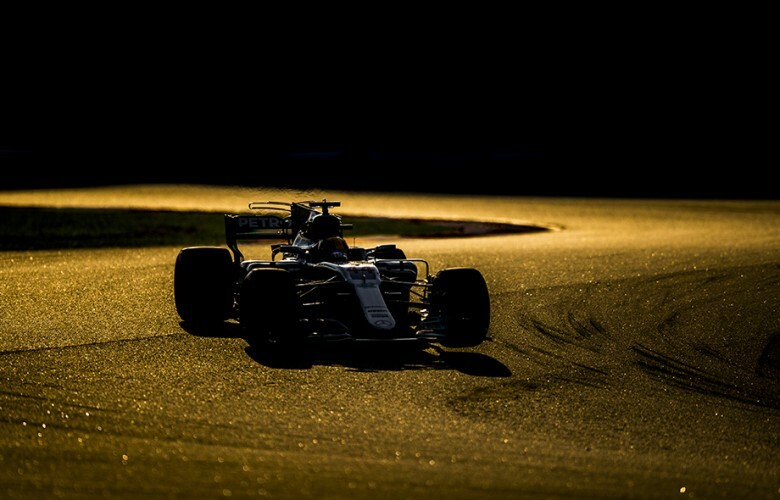 Valtteri Bottas of Finland and Mercedes AMG Petronas locks up in turn 1 during qualifying for the Malaysian Formula One Grand Prix at Sepang Circuit on September 30, 2017 in Sepang, Malaysia. 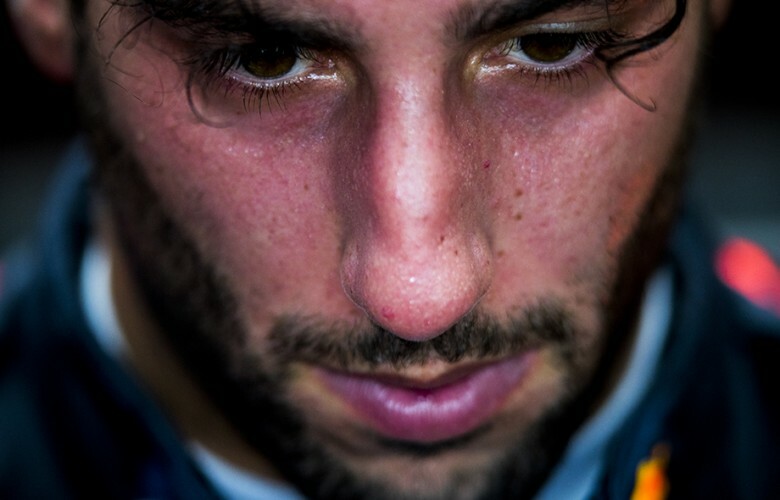 Drops of sweat comes down as Daniel Ricciardo of Australia and Red Bull Racing steps out of his car during practice prior qualifying for the Malaysian Formula One Grand Prix at Sepang Circuit on September 30, 2017 in Sepang, Malaysia. 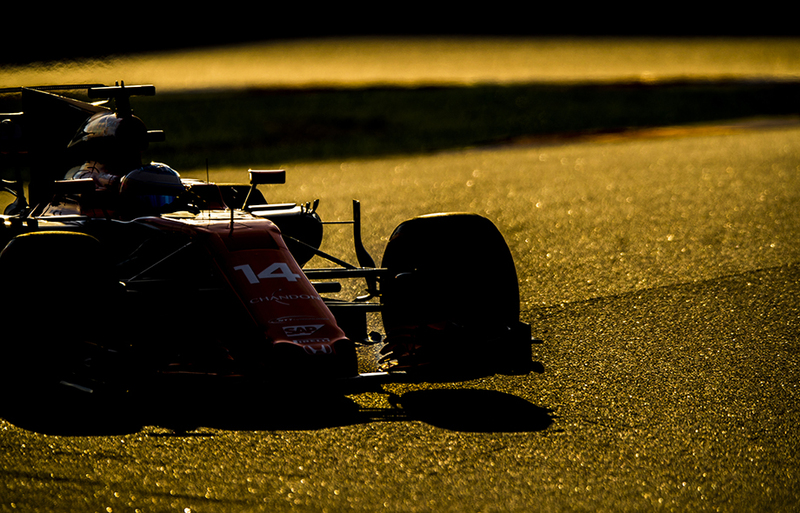 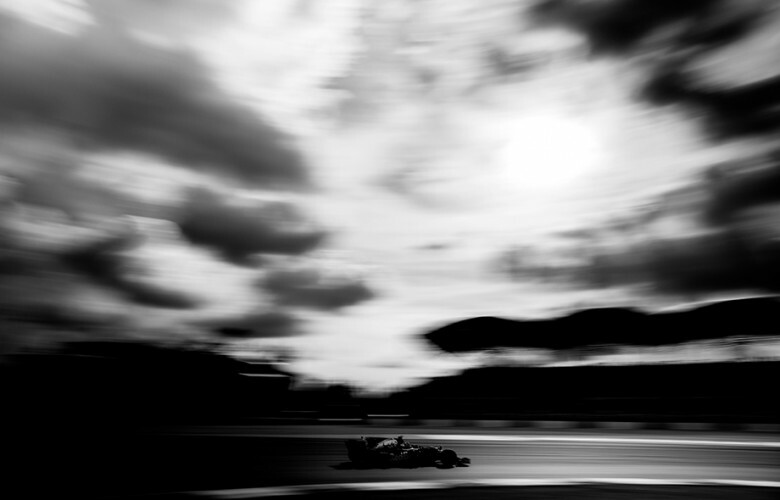 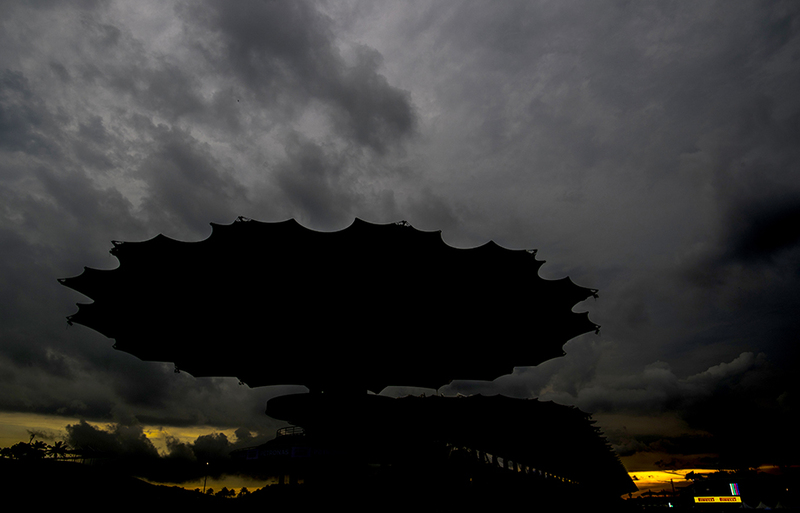 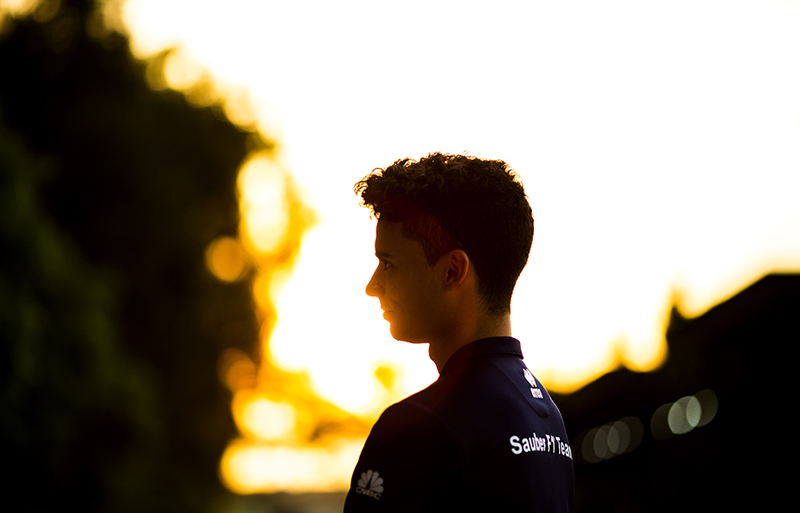 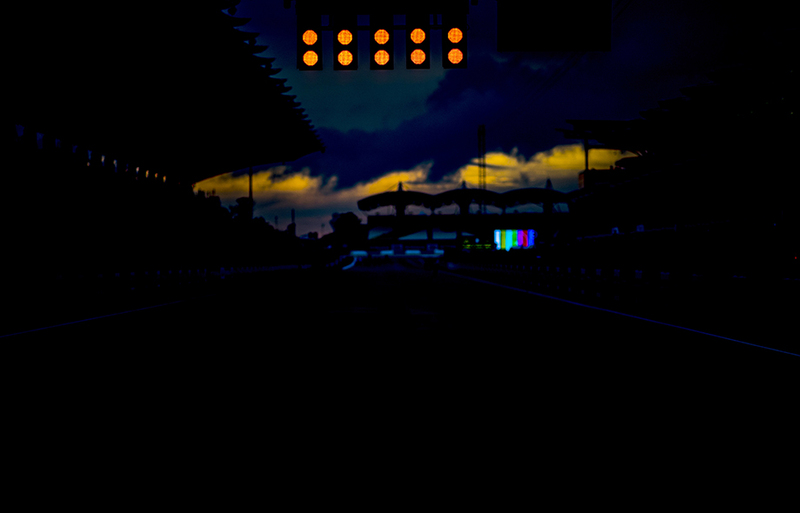 Sun goes down over the ciruit during practice for the Malaysian Formula One Grand Prix at Sepang Circuit on September 29, 2017 in Sepang, Malaysia. 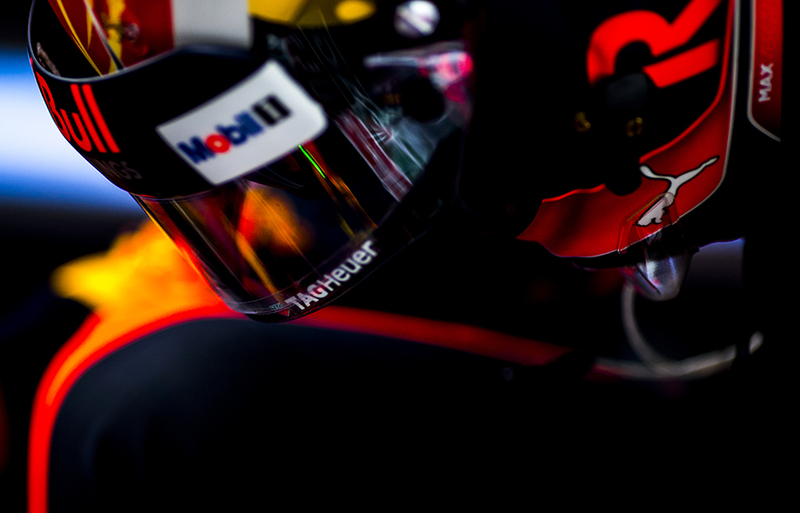 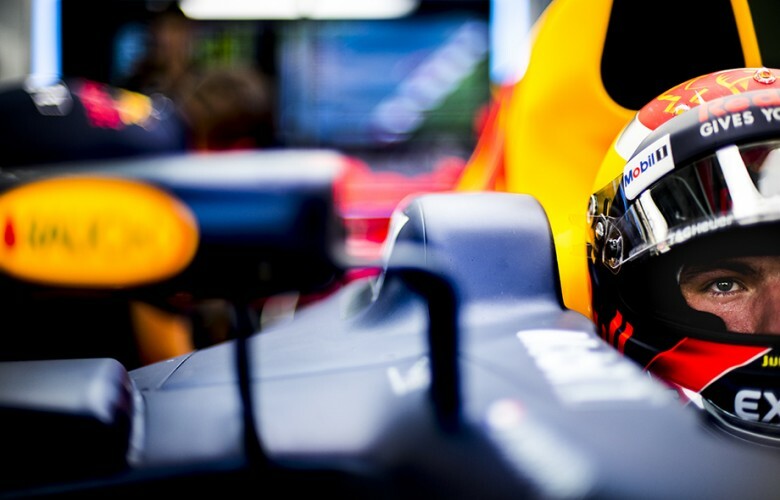 Max Verstappen of Netherlands and Red Bull Racing sits inside his RB13 during practice prior qualifying for the Malaysian Formula One Grand Prix at Sepang Circuit on September 30, 2017 in Sepang, Malaysia. 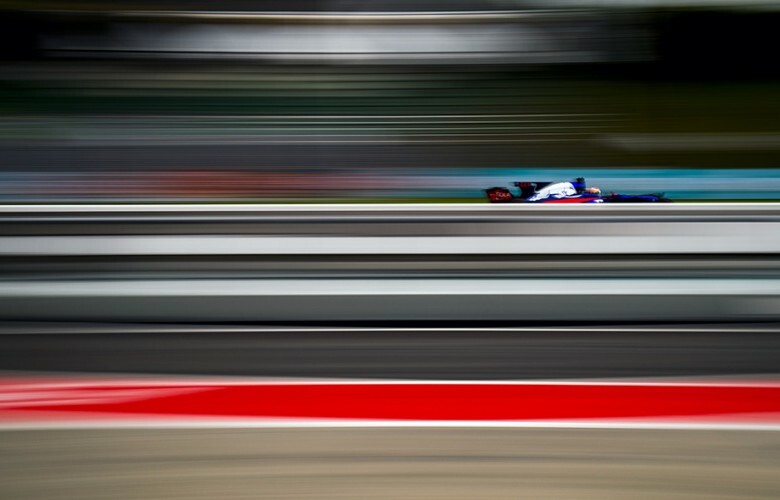 Carlos Sainz of Spain and Scuderia Toro Rosso drives his STR12 during qualifying for the Malaysian Formula One Grand Prix at Sepang Circuit on September 30, 2017 in Sepang, Malaysia. 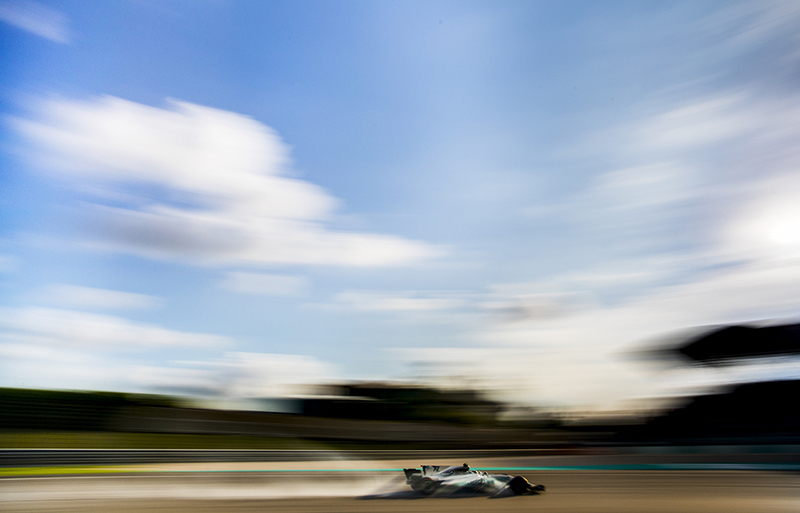 Lewis Hamilton of Great Britain and Mercedes AMG Petronas drives in W08 during qualifying for the Malaysian Formula One Grand Prix at Sepang Circuit on September 30, 2017 in Sepang, Malaysia. Max Verstappen of Netherlands and Red Bull Racing is seen on the grid prior to the Malaysian Formula One Grand Prix at Sepang Circuit on October 01, 2017 in Sepang, Malaysia. 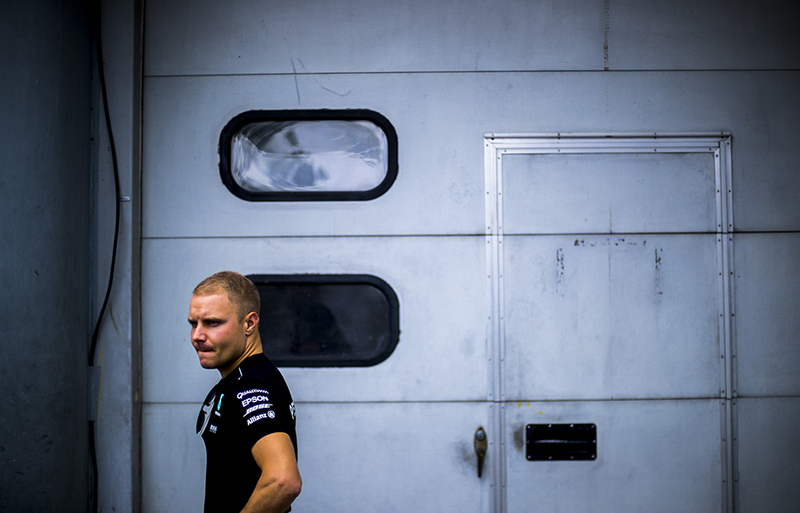 Valtteri Bottas of Finland and Mercedes AMG Petronas looks on ahead of the Malaysian Formula One Grand Prix at Sepang Circuit on October 01, 2017 in Sepang, Malaysia. 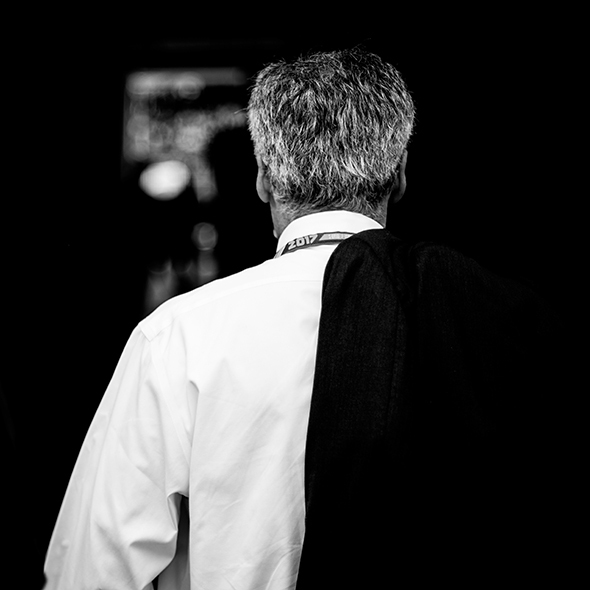 Chase Carey, CEO and Executive Chairman of the Formula One Group is pictured prior to the Malaysian Formula One Grand Prix at Sepang Circuit on October 01, 2017 in Sepang, Malaysia. 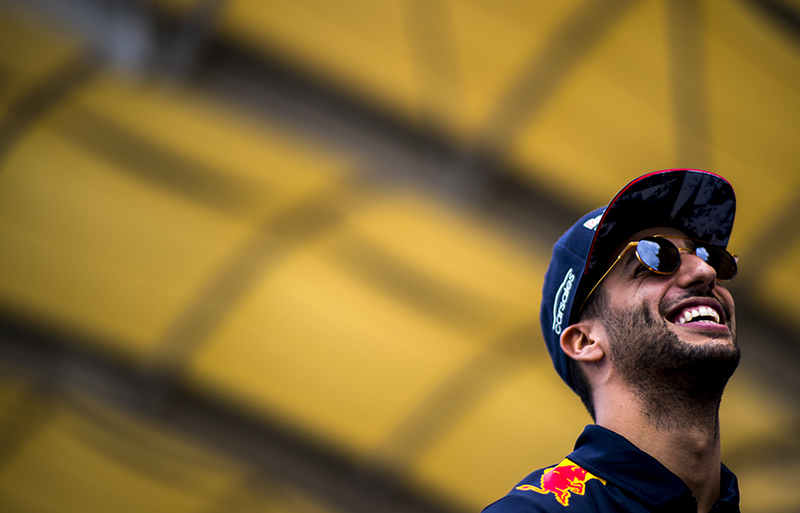 Daniel Ricciardo of Australia and Red Bull Racing smiles ahead of the Malaysian Formula One Grand Prix at Sepang Circuit on October 01, 2017 in Sepang, Malaysia. 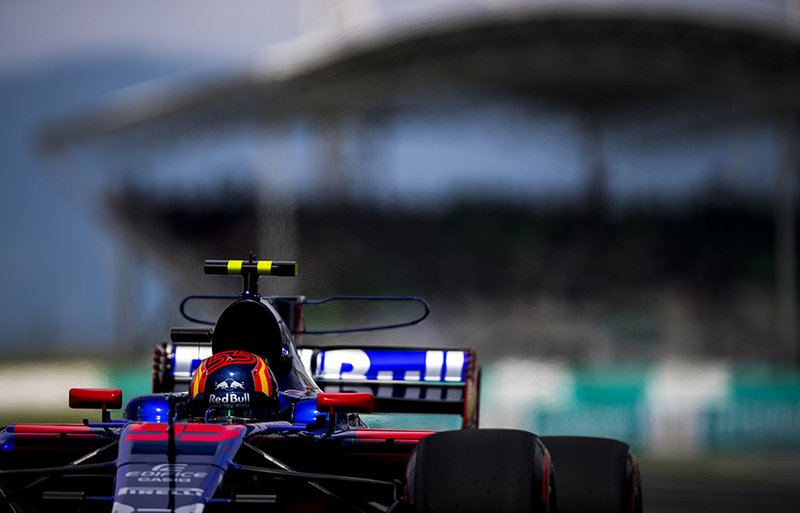 Carlos Sainz of Spain and Scuderia Toro Rosso drives his STR12 during the Malaysian Formula One Grand Prix at Sepang Circuit on October 01, 2017 in Sepang, Malaysia. Lewis Hamilton of Great Britain and Mercedes AMG Petronas is seen during driver's parade ahead of the Malaysian Formula One Grand Prix at Sepang Circuit on October 01, 2017 in Sepang, Malaysia. 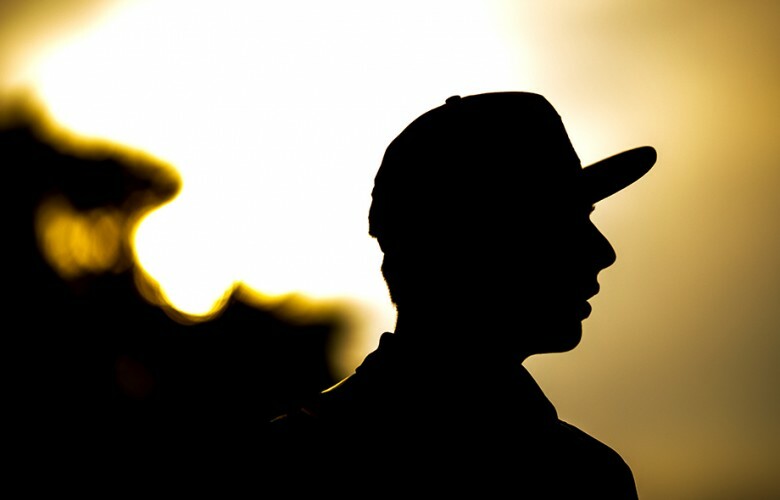 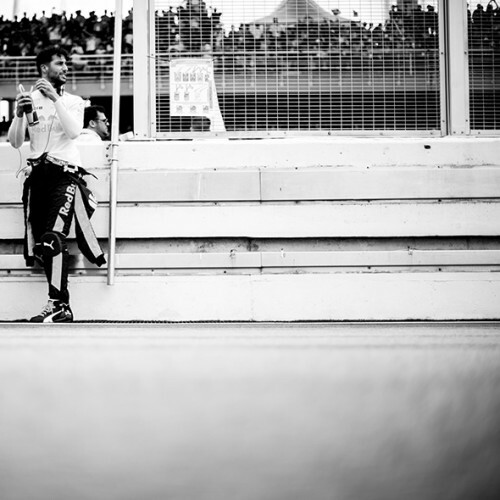 Daniel Ricciardo of Australia and Red Bull Racing stands on the grid ahead of the Malaysian Formula One Grand Prix at Sepang Circuit on October 01, 2017 in Sepang, Malaysia. 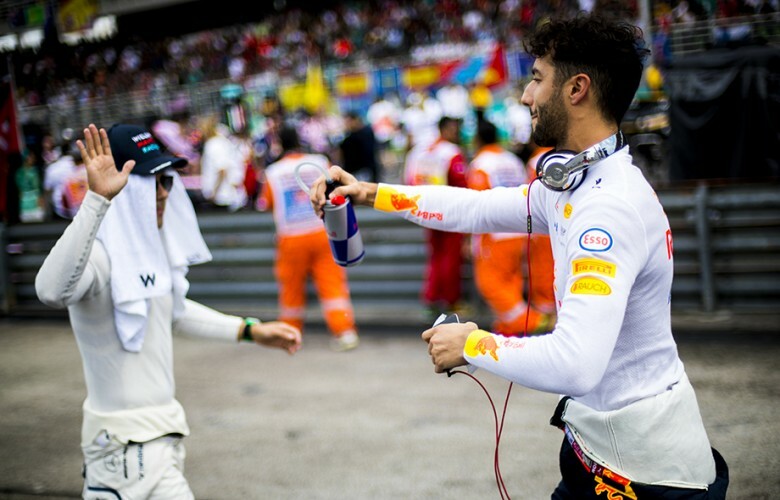 Daniel Ricciardo of Australia and Red Bull Racing and Felipe Massa of Brazil and Williams Martini Racing high five each other ahead of the Malaysian Formula One Grand Prix at Sepang Circuit on October 01, 2017 in Sepang, Malaysia. 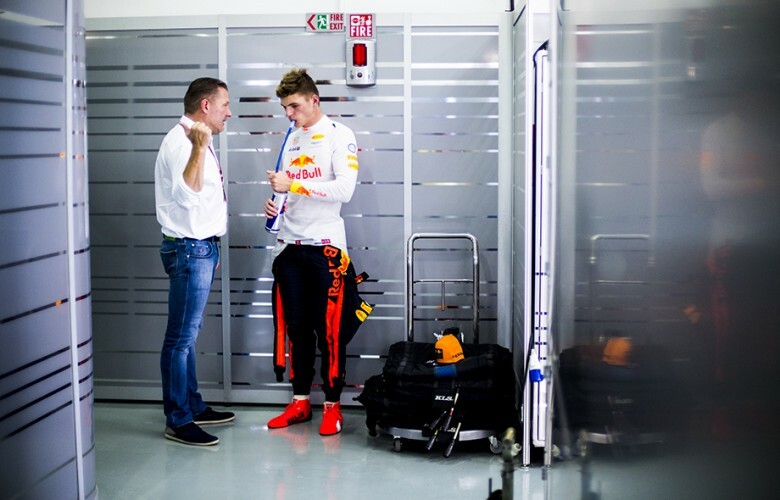 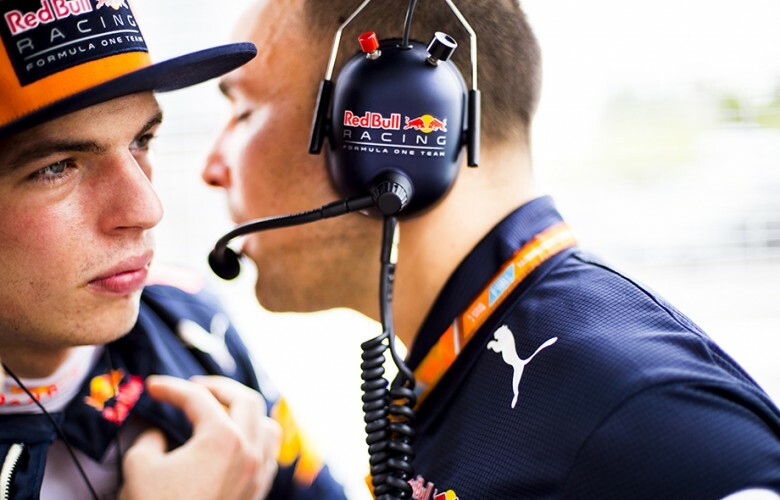 Max Verstappen of Netherlands and Red Bull Racing speaks to his race engineer Gianpiero Lambiase prior to the Malaysian Formula One Grand Prix at Sepang Circuit on October 01, 2017 in Sepang, Malaysia. 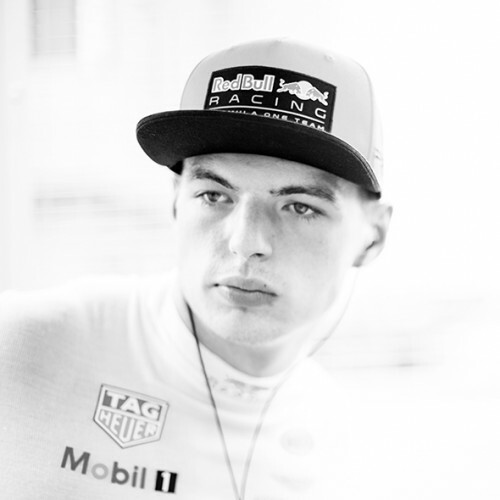 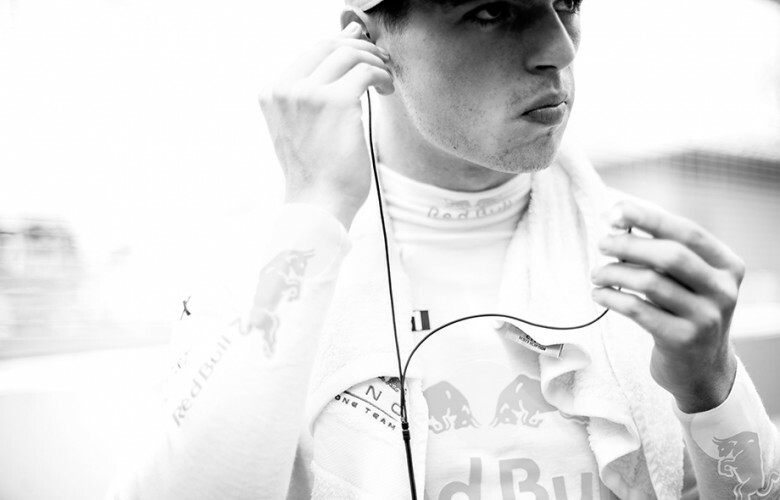 Max Verstappen of Netherlands and Red Bull Racing prepares on the grid prior to the Malaysian Formula One Grand Prix at Sepang Circuit on October 01, 2017 in Sepang, Malaysia. 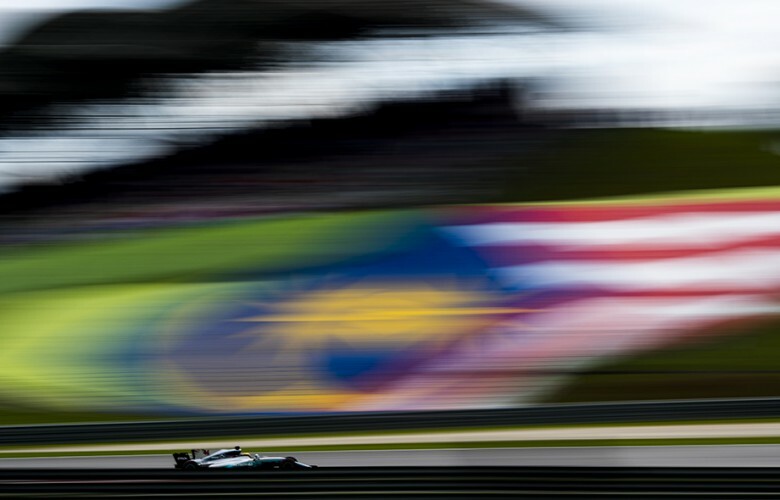 Lewis Hamilton of Great Britain and Mercedes AMG Petronas drives in W08 during the Malaysian Formula One Grand Prix at Sepang Circuit on October 01, 2017 in Sepang, Malaysia. 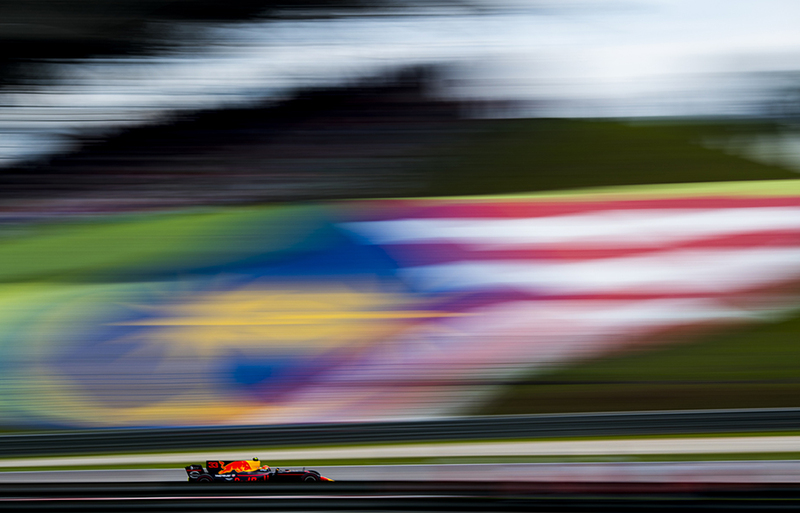 Daniel Ricciardo of Australia and Red Bull Racing drives his RB13 during the Malaysian Formula One Grand Prix at Sepang Circuit on October 01, 2017 in Sepang, Malaysia. 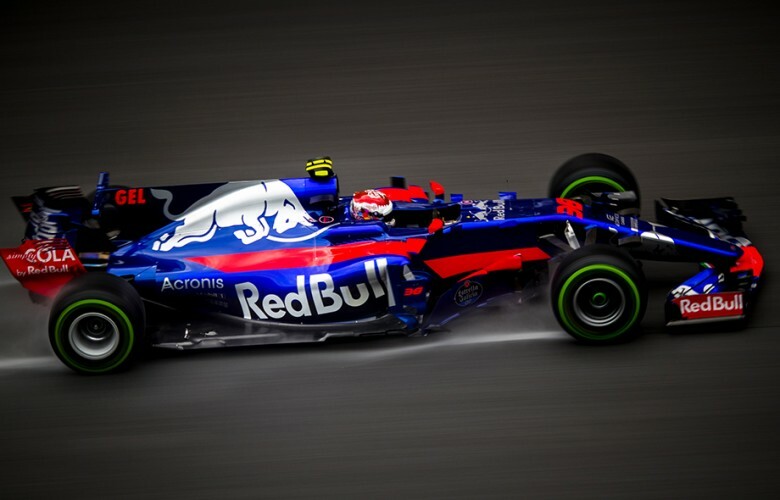 Pierre Gasly of France and Scuderia Toro Rosso drives his STR12 during the Malaysian Formula One Grand Prix at Sepang Circuit on October 01, 2017 in Sepang, Malaysia. 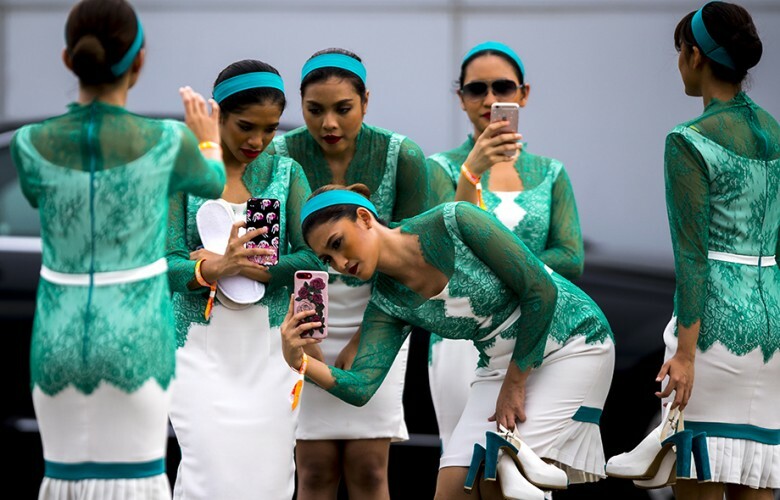 Grid girls take pictures of each other during the Malaysian Formula One Grand Prix at Sepang Circuit on October 01, 2017 in Sepang, Malaysia. Max Verstappen of Netherlands and Red Bull Racing drives his RB13 during the Malaysian Formula One Grand Prix at Sepang Circuit on October 01, 2017 in Sepang, Malaysia. 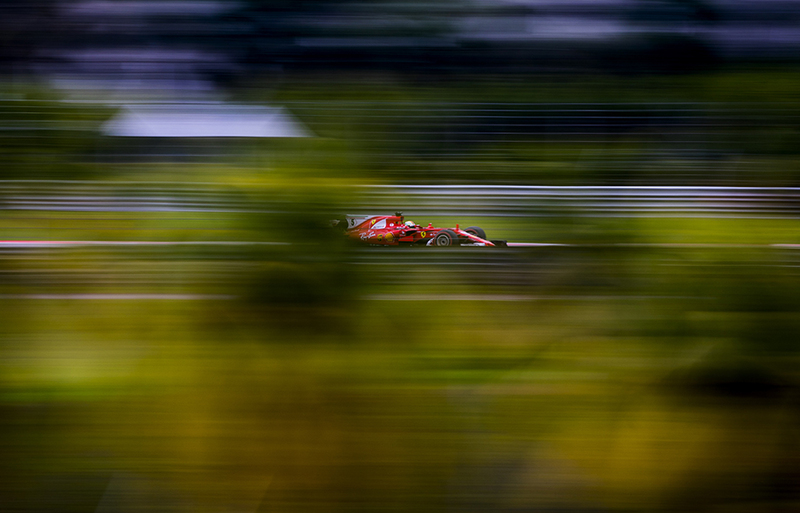 Sebastian Vettel of Germany and Scuderia Ferrari in action during the Malaysian Formula One Grand Prix at Sepang Circuit on October 01, 2017 in Sepang, Malaysia. 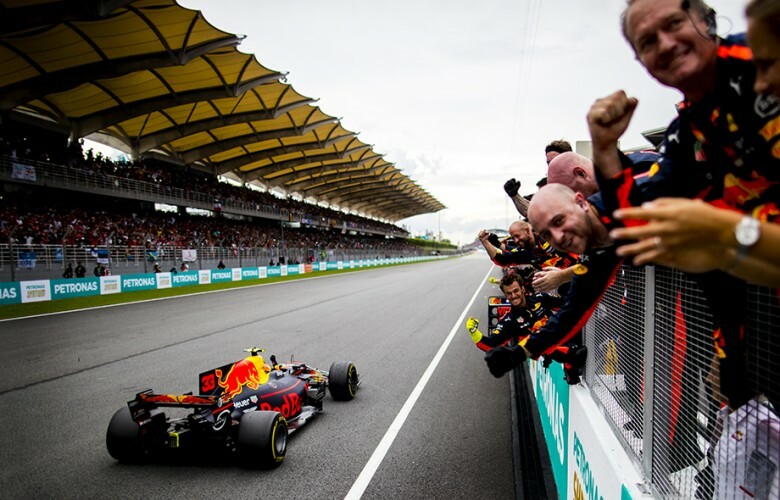 Max Verstappen of Netherlands and Red Bull Racing crosses the finish line to win the Malaysian Formula One Grand Prix at Sepang Circuit on October 01, 2017 in Sepang, Malaysia. 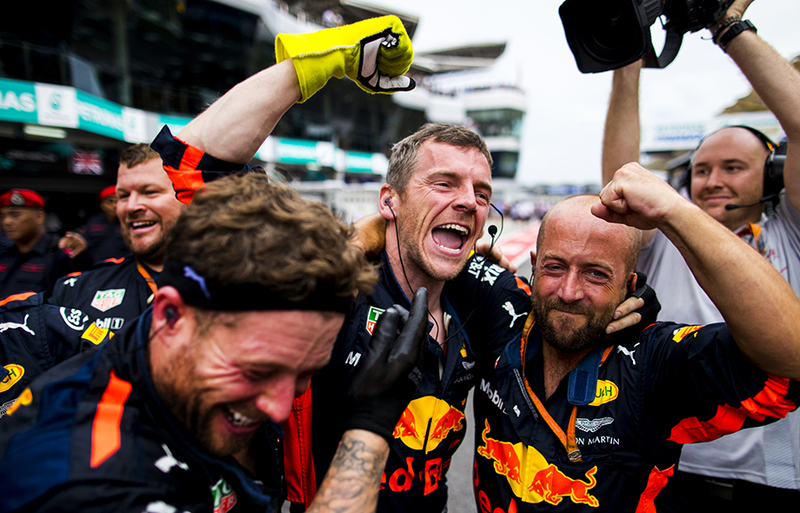 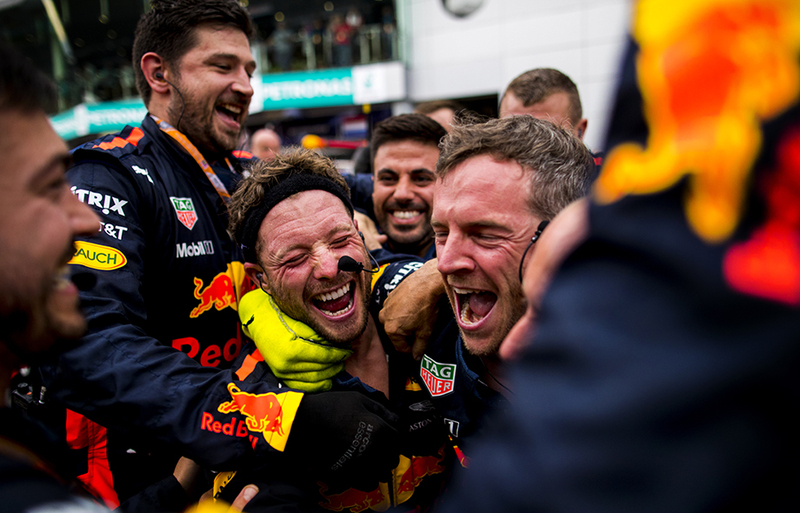 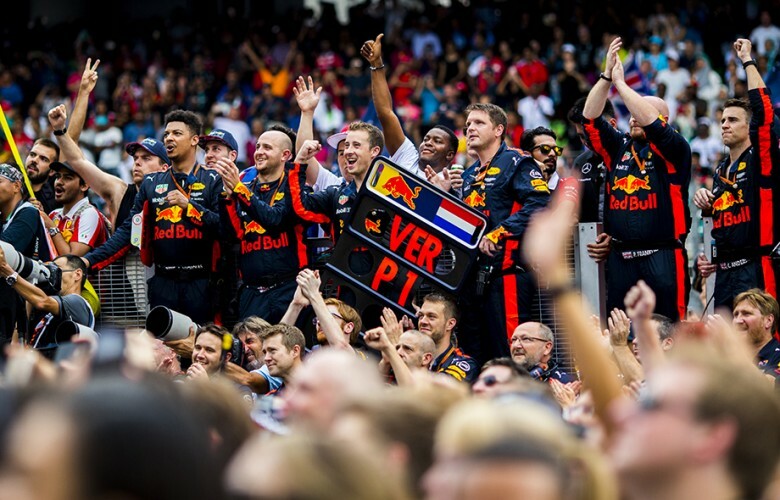 Red Bull Racing team celebrates as Max Verstappen of Netherlands and Red Bull Racing wins and Daniel Ricciardo of Australia and Red Bull Racing comes third during the Malaysian Formula One Grand Prix at Sepang Circuit on October 01, 2017 in Sepang, Malaysia. 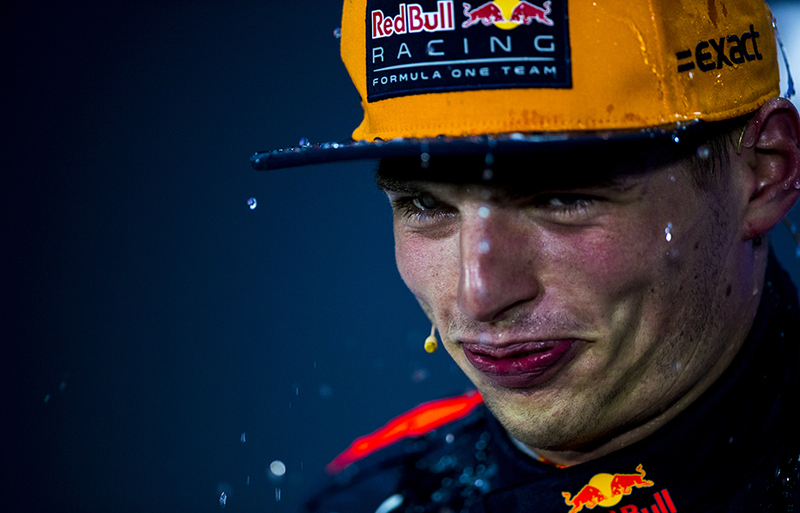 Daniel Ricciardo of Australia and Red Bull Racing pours water on the head of Max Verstappen of Netherlands and Red Bull Racing during a press conference following Verstappen's win at the Malaysian Formula One Grand Prix at Sepang Circuit on October 01, 2017 in Sepang, Malaysia. 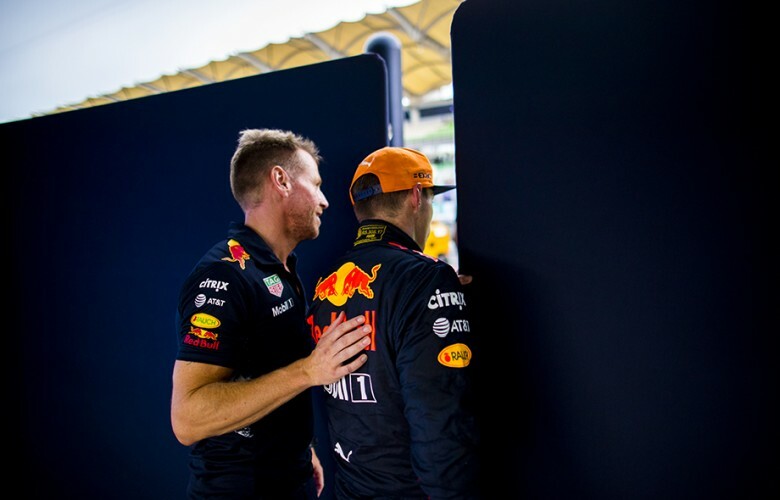 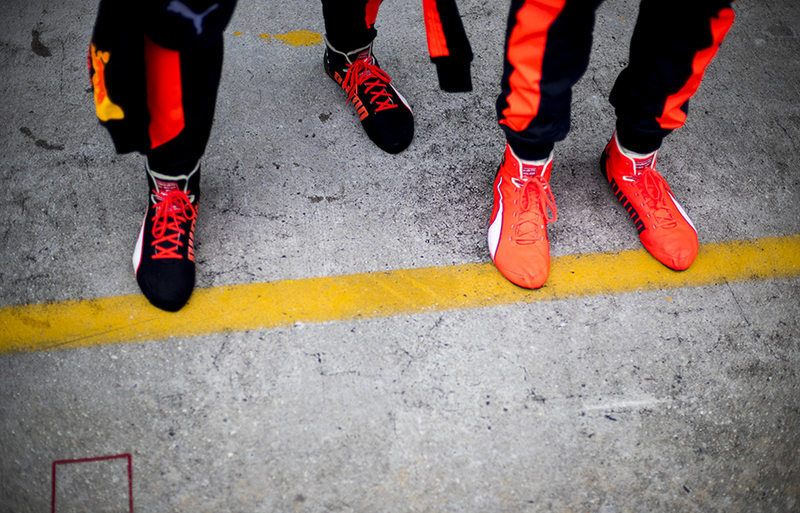 Daniel Ricciardo of Australia and Red Bull Racing and Max Verstappen of Netherlands and Red Bull Racing stand in the pitlane following the Malaysian Formula One Grand Prix at Sepang Circuit on October 01, 2017 in Sepang, Malaysia. 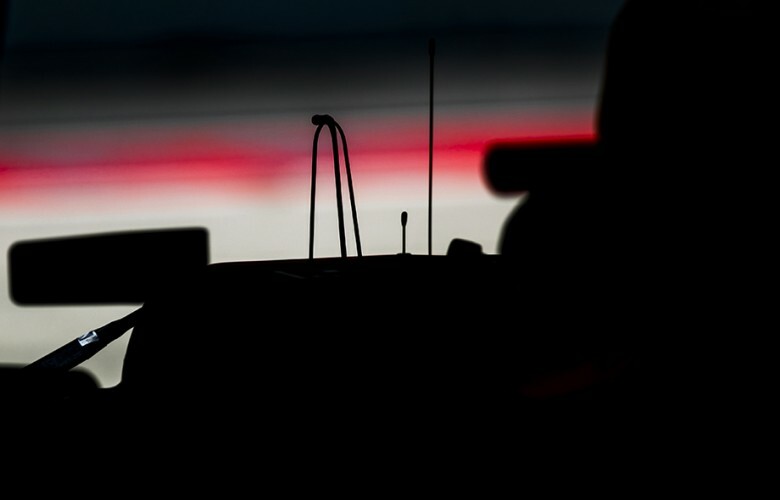 A detail view of the nose of the winning RB13 of Max Verstappen of Netherlands and Red Bull Racing is seen following the Malaysian Formula One Grand Prix at Sepang Circuit on October 01, 2017 in Sepang, Malaysia. 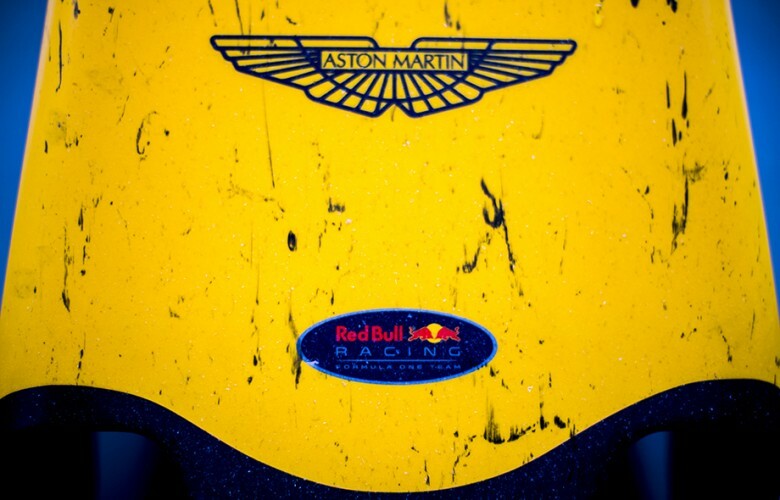 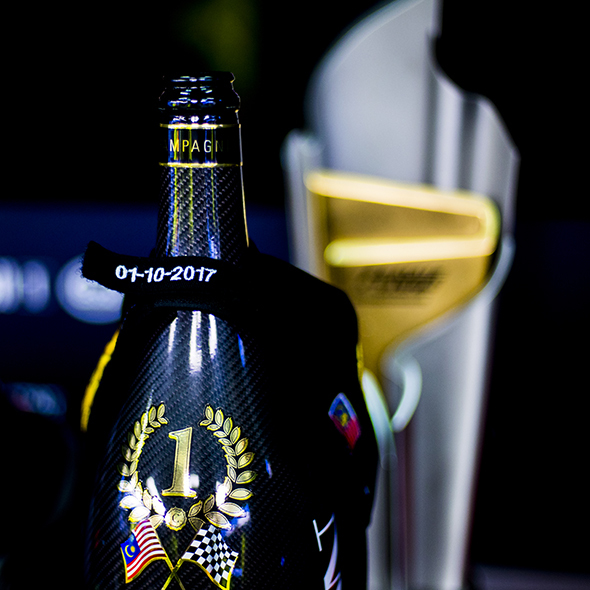 A detail view of a winning champagne of Max Verstappen of Netherlands and Red Bull Racing is seen following the Malaysian Formula One Grand Prix at Sepang Circuit on October 01, 2017 in Sepang, Malaysia. 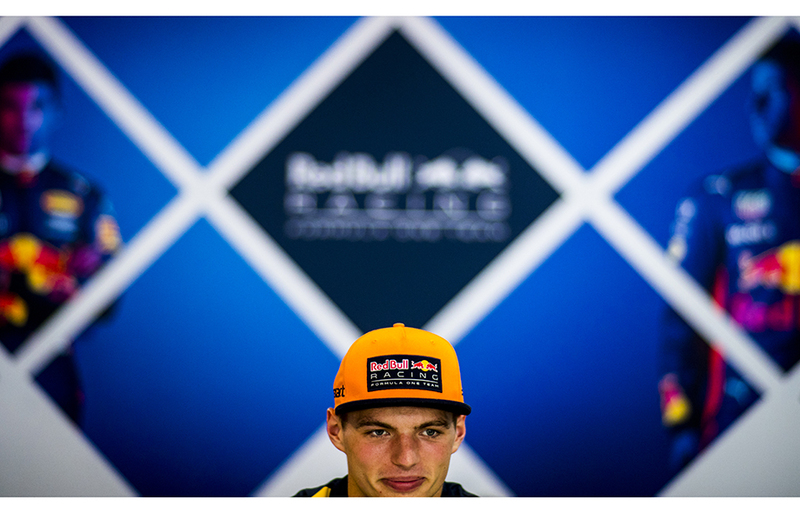 Max Verstappen of Netherlands and Red Bull Racing waits behind the garage covers ahead of a team photo to celebrate his win during the Malaysian Formula One Grand Prix at Sepang Circuit on October 01, 2017 in Sepang, Malaysia.